Last Tuesday Jose told me he has tarantulas (bird spiders) in his garden and he would try to capture one for me, hopefully without his boxer dog killing it first. Last Friday I noticed his Messenger nick: "HEY John YA Capture tu TARANTULA". But I was quite busy at that time. And today, around 8 p.m. he visited us with a big tarantula in a plastic cake box. The spider is much bigger then the one I already have, and looks very impressive. 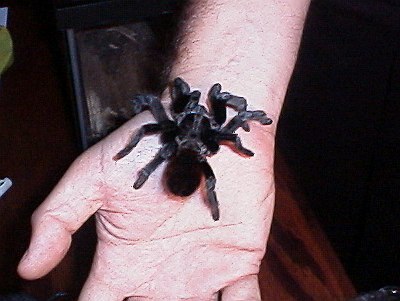 When I was about to transfer the tarantula to its housing I couldn't resist to try to let it walk on my hand. At first I tried to let it walk off the piece of paper I used to get it out of the cake box, on my hand. But that didn't work. On the Arachnoboards Tarantula forum I had seen three handling methods described, and I decided to give the cupping method a try. And it worked, sort of, the spider decided that step 5 was enough and started to put its legs on my fingers, so I could lift it. 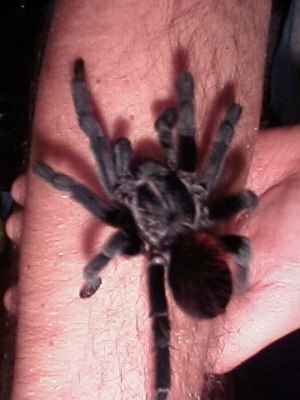 This was the first time I let a spider this big walk on my hand and arm. I had been thinking for quite some time to try this with the much smaller tarantula I have, but somehow big works better for me. Maybe it because looks more innocent. Esme was watching from a distance, and told me many times to be very careful. The legs of the spider gave a scratching feel when it walked on my arm. After Esme had taken some pictures I carefully put the spider in its new home, and washed my hands and arm. Later, in the night, I searched the Internet for an identification. 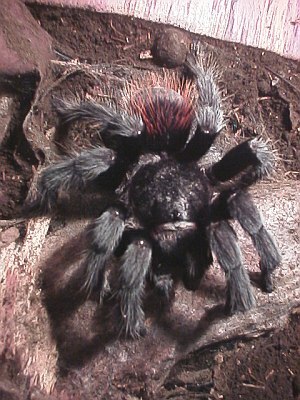 It looks like the spider is a Brachypelma sp., most likely B. vagans (Mexican Red-Rump). The width of the above image is roughly 2.5 inch, body length (head-abdomen) roughly 2 inch. 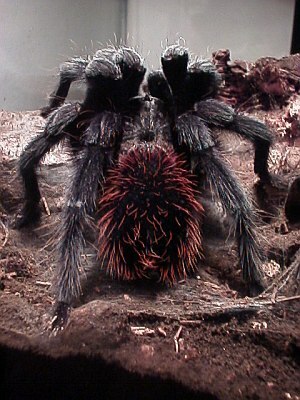 Tarantula, rear view. Notice the nice red hairs. It's a wonderful creature and I can't imagine people being afraid of it. I referred jokingly to it as the mouse with eight legs. 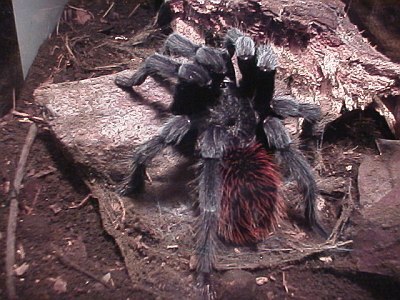 A final note on handling though: I don't recommend handling tarantulas often. They are not really pets, and handling might cause quite some stress. Accidents do happen, and you might end up with a dead tarantula on the floor, and a painful bite.